In 1923, the Bronfmans purchased the Greenbrier Distillery in the United States, dismantled it, shipped it to Canada, and reassembled it in LaSalle, Quebec. The Bronfmans shipped liquor from Canada to the French-controlled overseas collectivity Saint Pierre and Miquelon off the then-Dominion of Newfoundland, which was then shipped by bootleggers to Rum rows in New York, New Jersey and other states. Although he was never convicted of criminal activity, Samuel Bronfman's dealings with bootleggers during the Prohibition-era in the United States have been researched by various historians and are documented in various peer-vetted chronicles. In the 1930s, when Seagram set up business in the United States, it paid a fine of $1.5 million to the US government to settle delinquent excise taxes on liquor illegally exported to the US during Prohibition. The US government had originally asked for $60 million. After the death of Samuel Bronfman in 1971, Edgar M. Bronfman was named Chairman and Chief Executive Officer (CEO) until June 1994 when his son, Edgar Bronfman Jr., was appointed CEO. In 1986, the company started a memorable TV commercial campaign advertising its Golden wine cooler products. With rising star Bruce Willis as pitchman, Seagram rose from fifth place among distillers to first in just two years. 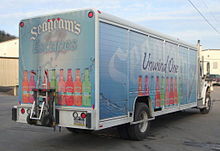 In 2002, The Coca-Cola Company acquired the line of Seagram's mixers (ginger ale, tonic water, club soda and seltzer water) from Pernod Ricard and Diageo, as well as signing a long-term agreement to use the Seagram name from Pernod Ricard. On April 19, 2006, Pernod Ricard announced that they would be closing the former Seagram distillery in Lawrenceburg, Indiana. However, the distillery was instead sold in 2007 to CL Financial, a holding company based in Trinidad and Tobago which then collapsed and required government intervention. They operated the distillery as Lawrenceburg Distillers Indiana. In December 2011, the distillery was purchased by MGP Ingredients, headquartered in Atchison, Kansas. It is now known as MGP of Indiana, and continues to be the source of the components of Seagram's Seven Crown, now owned by Diageo. In 1997, the Seagram Museum, formerly the original Seagram distillery in Waterloo, Ontario, was forced to close due to lack of funds. The building is now the home of the Centre for International Governance Innovation as well as Shopify. The two original barrel houses are now the Seagram Lofts condominiums. There were almost 5 acres (2.0 ha) of open land, upon which the Balsillie School of International Affairs was subsequently built; construction began in 2009, and was completed in 2010. ^ Desjardins, Sylvain-Jacques (2004-04-25). "Seagram Building reborn as Martlet House". McGill Reporter. Retrieved 2009-02-07. ^ "Pernod Ricard and Diageo Sell Seagram's Mixers to The Coca-Cola Company. Business Wire May 7, 2002". Retrieved 2010-12-29. ^ MGP Ingredients Inc. to Purchase Lawrenceburg, Indiana Distillery Assets, company press release, Oct. 21, 2011. ^ Slater, Joanna (5 April 2013). "Charles Bronfman opens up about Seagram's demise: 'It is a disaster'". The Globe and Mail. Retrieved 2013-04-08. ^ Mercer, Greg (January 8, 2009). "New Balsillie School will be 'functional, not fancy', The Record, January 8, 2009". Kitchener Record. Retrieved 2009-08-10. This page is based on the Wikipedia article Seagram; it is used under the Creative Commons Attribution-ShareAlike 3.0 Unported License (CC-BY-SA). You may redistribute it, verbatim or modified, providing that you comply with the terms of the CC-BY-SA.